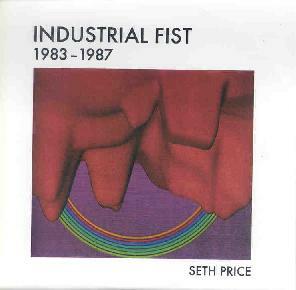 Seth Price - "Industrial Fist: 1983-1987"
The 80s certainly produced its share of egregious music, but it also gave us a few innovative artists whose influence is only now being felt in genres as far apart as black metal, trip hop and space rock. Seth Price’s belated compilation — aptly titled Industrial Fist — encapsulates some of the seminal groups who blazed fiery paths through the murk and monotony of the post-punk new wave landscape. And Industrial Fist certainly packs a lethal punch, especially considering the impressive names anthologized here, including Skinny Puppy, Ministry, Front 242, Frontline Assembly, and Controlled Bleeding. There are no liner notes, song title listings or any information at all to celebrate the not insignificant accomplishments of the artists included in this 50 minute encomium to the 80s killing floor that today has given way, sadly, to a host of insipid DJs and samplists. On the other hand, such artful anonymity seems entirely appropriate for groups who championed the marriage of man and machine and the eventual dissolution of the individual as a viable instrument for the expression of musical data. If such skeletal packaging is an annoyance to some, it’s probably the only complaint you’ll have about this brisk and brusque collection of industrial electro-dance fistfuck anthems. Everything is here that you’d expect: the malevolent guitar-meets-machine rock of Ministry; the merciless electrorhythmic venom of Skinny Puppy; and the menacing sequencer-driven futurism of Front Line Assembly. More than just a molten blast from the past, Industrial Fist is a prescient reminder that we’re still living — and dying — in the furnace of the post-industrial revolution. For more information you can visit http://www.free103point9.org.